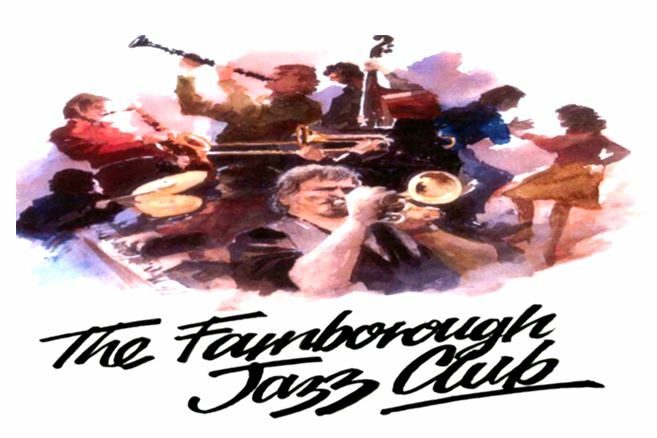 RED WING BAND (from Sweden) with guest BRIAN CARRICK appeared for the first time here at FARNBOROUGH JAZZ CLUB on Friday, 31st October 2014. We were so proud another exciting band included us as part of their UK 2014 Tour. 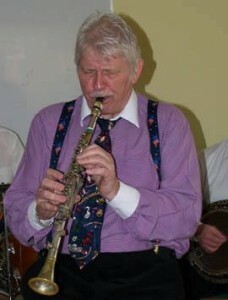 The band members included their leader and trombonist, HANS ZAKRISSONV, with SVERKER NYSTRON on clarinet and alto sax, LIEF MELDAHL on bass, HANS JORGENSEN on banjo, INGAMAR WAGERMAN on piano and RONALD ANDERSON (from Denmark) on drums. 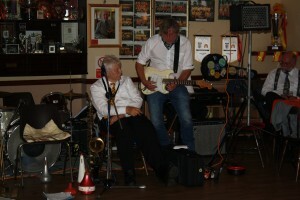 They had a special guest with them, who was our very own BRIAN CARRICK on reeds. They were all exceptional together. What a band! 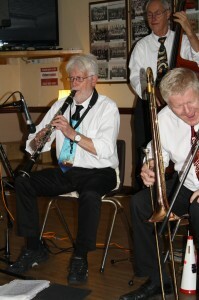 Brian is best known to most of you as leader of his own highly popular ‘Brian Carrick’s Algiers Stompers’ band and has already appeared here at Farnborough (I have found write-up for 26th October 2012, so have published it for that date!). Of course, you may recall, Brian plays the old metal clarinet belonging to George Lewis, (given to him by George’s daughter). Right from their first number, you knew we were in for a super evening. It began with their signature tune, ‘Red Wing’, which brought on the dancers immediately. 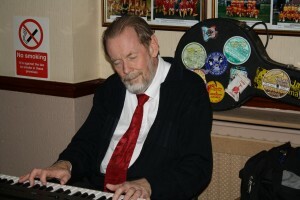 We did not have our Gordon to start the dancing off, he being in hospital (now recovering from quadruple by-pass). However, we were delighted to have been joined by a new couple, Jane and Alan (regulars with 1066 Club at Hastings) who came especially to see the band. Keith thought they were the cabaret act with the band. [We do hope to see you both again, you were thoroughly entertaining too, although Gordon said to tell you to lay off his patch – only joking.] The next number to mention is George Lewis’ own ‘Burgundy Street Blues’. Brian sang it and played George’s clarinet (quite a lovely thought). Another tune I think George was associated with, was ‘Postman’s Lament’, which was great. I think Brian sang the next one, ‘Moonlight and Roses’, but did not make any notes, as I was too busy enjoying a dance with Steve. Now I know Brian sang the next number, because he was fantastic – like a ‘rock’ star. 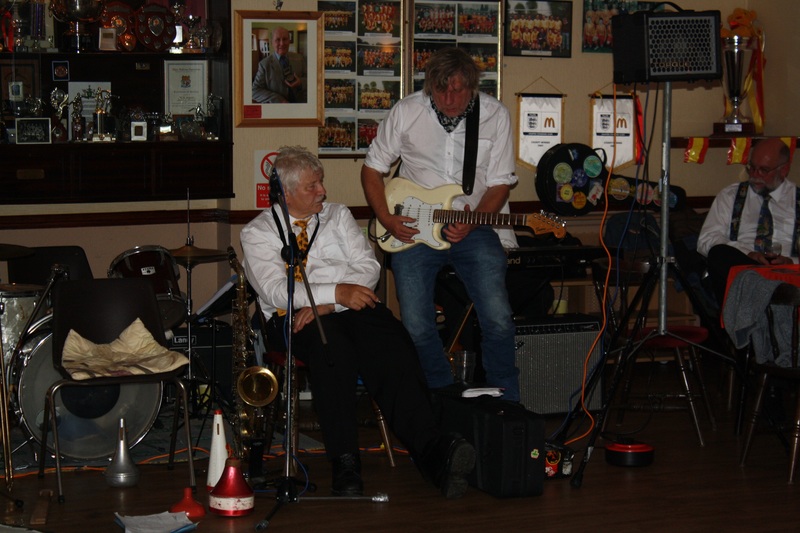 Ronald Anderson had come out from behind the drums to play electric guitar and the two of them were brilliant – we were all mesmerised. The number? ‘Muddy Road’. At the end of the evening, I told Ronald I was sure I knew him. Of course I knew him, he had played for us many times with Phil Mason’s All Stars’ and including Warwick Leadlay’s Starborough Castle jazz weekends too. A lovely number ‘June Night’ (a Tommy Dorsey ‘hit’) came next and was followed by a great Latin American number called ’Laughing Samba’. This is a dance I just love and once again, enjoyed seeing Jane and Alan (I don’t think they missed a dance). Another favourite of a quite a few people at the club was ‘St. Philip Street Breakdown’. After all, it has been recorded by all the greats. So we come to the last number, aptly named ‘Till We Meet Again’. We hope we do get to see them again. What a wonderful evening. Ser fram emot att jazzing med dig Red Wing Band igen – and happy jazzin’ to our audience too. Didn’t I tell you last week, you can get ready for a fabulous time on Friday? Wasn’t I right? 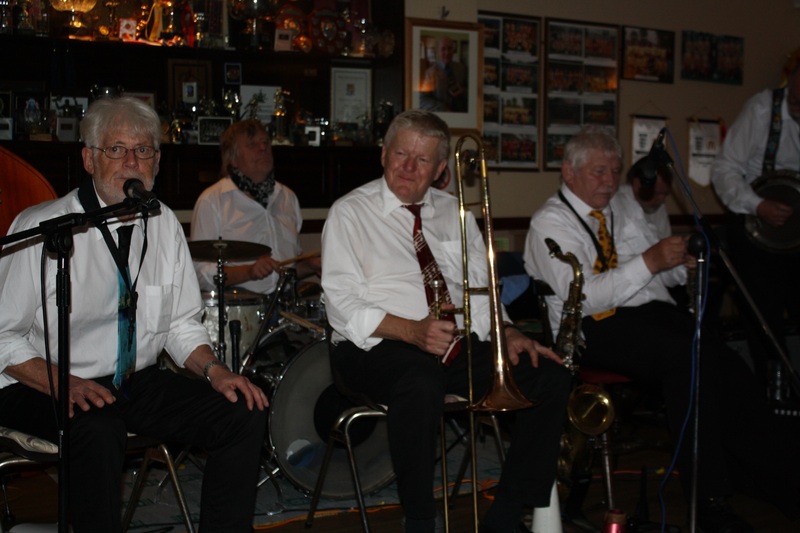 This entry was posted in Brian Carrick's Algiers Stompers, Red Wing Band from Sweden with guest Brian Carrick on November 2, 2014 by Diane.